Photograph of campus, showing the Vernon Strombeck Library at the front right; aerial photo. 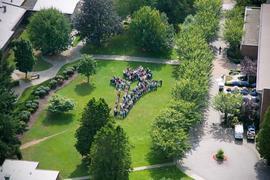 Photograph of campus grounds, taken from the south; aerial photograph. Photograph of the central campus buildings, showing Fraser Hall, with a recent expansion, near the centre of the photo; aerial photograph taken from the southwest. 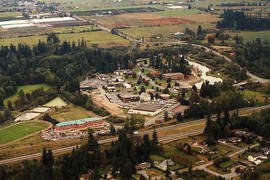 Photograph of the TWU campus taken from the Southwest; aerial photograph.